Polybloggimous: In Which I Deliver An Impassioned And Eloquent Commentary On The Hank Williams, Jr. Contretemps. 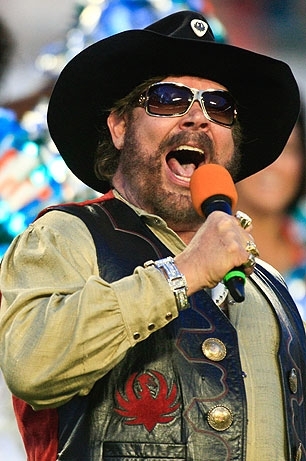 In Which I Deliver An Impassioned And Eloquent Commentary On The Hank Williams, Jr. Contretemps. The guy's kind of a putz, isn't he? Why, yes; yes, he is. I imagine I'll be fine. Unless Hank reads this, gets pissed, and decides on a side trip to Brooklyn. Uhh.... What am I missing? Can't speak for Nathan, but I was concerned that he had strained something making his impassioned, eloquent, long-winded commentary. I think I broke a fingernail stealing linkage from Jay Allbritton to post on my blog, so I know the dangers of overdoing it in the name of our art. So moved by your passion. God bless! *Usually when someone says, "I take him at his word", they mean "Uh, sure" ::wink, wink::, but in this case I really take him at his word with no winking involved. I also believe that he uses the words "liberry", "axe", "irregardless" and "hugga-mugga" in formal conversation. Oh, BTW, a lot of people immediately mentioned The Dixie Chicks when this all started without quite drawing out the comparison to any conclusion. I'll be surprised if any venue cancels one of his appearances. He certainly won't be the recipient of a bunch of death threats the way The Dixie Chicks were. These are not equivalent situations from opposite sides of the aisle. You probably shouldn't have to expend that much effort explaining your one line blog. I never read beyond the Forbes article (and I just scanned it) and I was blissfully ignorant of any nuances until reading your reply. I don't watch football (or do you call it soccer in the US?) nor do I listen to C&W music (at least not often). Frankly, I was happy not knowing about any of this. Also, when I posted my first reply I got logged out of my business gmail account (I use my personal gmail account on blogspot) and was late answering a client's e-mail. You know Nathan, if you hadn't posted that, I might have remained blissfully ignorant to the entire things. I take my responsibilities seriously. You're welcome.